Although the refreshed 2018 Ford F-150 has received a Top Safety Pick award from the Insurance Institute for Highway Safety (IIHS), it still failed to achieve the agency’s highest award due to one reason: its headlights. Are these the base or optional headlights, you might ask? Both. The IIHS gave the F-150 a "Poor" headlight rating because the standard halogen units provide "inadequate visibility in all scenarios," while the optional LED units "provide somewhat better visibility, but the low beams create excessive glare for oncoming drivers." Being awarded a Top Safety Pick+, the highest rating possible, requires a vehicle to earn an "Acceptable" or "Good" score in the headlight test. Fortunately, the 2018 F-150 earned a "Superior" rating for its optional front crash prevention system, which managed to avoid collisions in IIHS track tests at 12 mph and 25 mph. The crew cab and extended cab versions received "Good" ratings in all five of IIHS crash tests. The IIHS still has not released its findings for the new passenger-side small overlap test, which replicates what happens when the right corner of a vehicle hits an object or another car at 40 mph. 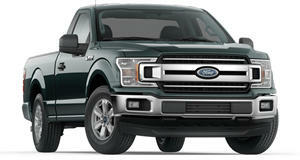 The Ford F-150, America’s best-selling truck, receives a number of improvements for model year 2018, such as new safety technologies, revised engine options, including the new 3.0-liter turbo diesel, an optional 10-speed automatic transmission, as well as a number of styling updates inside and out. We wouldn’t be surprised to learn that Ford will fix the headlight issue before long.